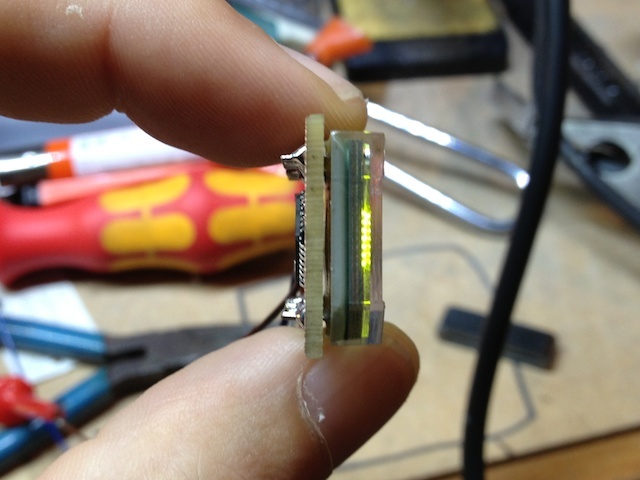 I’ve got a few of these little LED displays knocking about. They’re the same kind I used a couple of years ago on my Landrover speedo thingy. They’re not too tricky to use with a microcontroller, but you’ve got to connect at least half of the 26 legs on them to display anything meaningful. It’d be a lot simpler, wiring-wise, if you could treat them like a serial display; then you’d only need 3 wires to bring them to life – power, ground and serial data. I realised that you could actually fit a surface-mount Atmega [Arduino] chip between the pins on the back if you were careful, so I designed a little “backpack” circuit that you can solder the display to, which handles all the various connections and leaves you just to give it power and data to display. The schematic isn’t particularly interesting (email me if you want it) but it was simple enough to lay out. I’m starting to find that when designing boards to go in tight spaces, it’s best to be flexible with which pins connect to what; go with what’s easiest to layout, then you can untangle it all in the software. 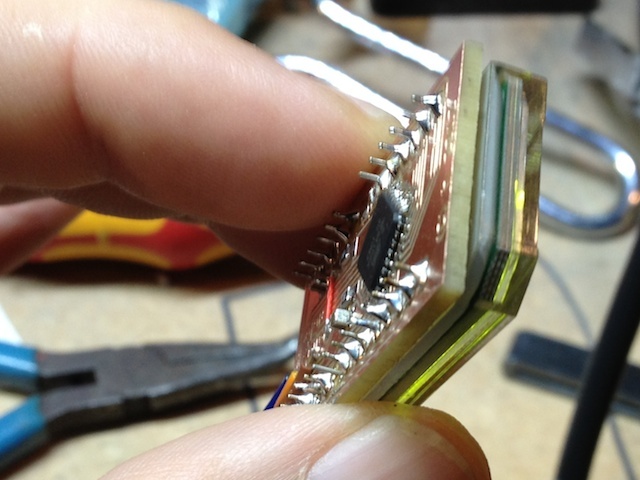 Here it definitely made sense to work out which Atmega pins were going to end up nearest to the display pins first – so you end up deriving the circuit diagram from the layout, rather than the other way round. This is great to see. I’m slowly updating an EMCO PC MILL 50. Also from the ‘recycle bin’. I’m using a more traditional approach and using MACH 3 with an on board PC to run fresh motors and drivers. How are you controlling your mill, as I too want to produce PCB’s with it. Yup – Mach3. 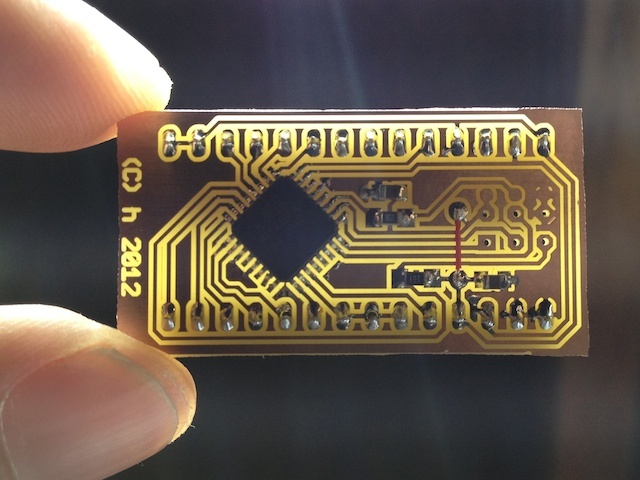 I use Eagle to design the boards, then use the free pcb-gcode plugin to produce the G-code. Before opening them in Mach3 I run the file through a little optimiser utility (OPT-QT, if I remember right) which reorders the cuts, almost halving the time some boards take to mill. 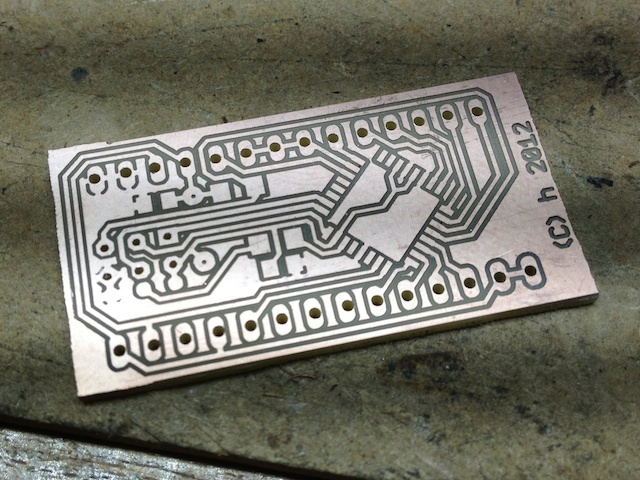 That pcb-gcode plugin works well. Just need to adjust the widths carefully to avoid overlaps. Very happy with the results. If the board is not flat, it can be compensated for by probing multiple x-y sites and some math. 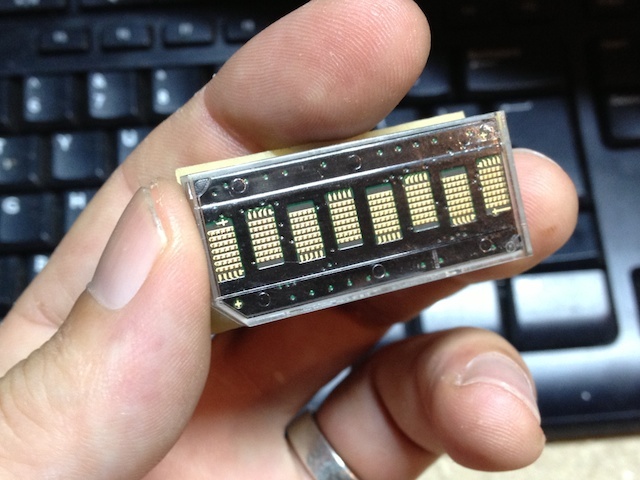 I like the method of just planning the board holding the pcbs with a large milling bit – then it’s perfectly parallel to the bit. Some purists might balk at this. I say, if it works, then so be it. 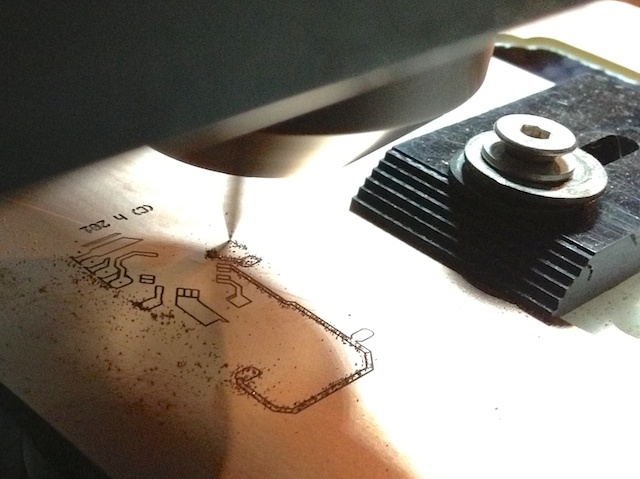 Agreed – using the mill itself to make your base board flat just seems the most logical approach. 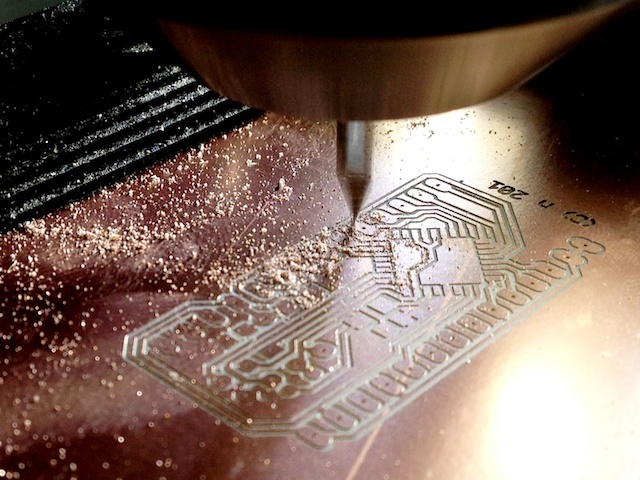 The probing-the-corners method is probably grand if your CNC s/ware has the ability to use that info to transform the g-code, but I’m not sure if Mach3 can do it.